Family of scholars and rabbis that derived its name from Melli, an Italian village in the province of Mantua. The family can be traced back to the fifteenth century. Rabbi of Venice in the sixteenth century. He is mentioned in the responsa of Moses Provençal (No. 194). The earliest known member of the family; rabbi of Parma in the second half of the fifteenth century. Among the Italian manuscript responsa in the possession of Mortara there is one of Elijah Melli's, addressed (1470) to Joseph Colon, concerning the divorcing of a baptized Jew. 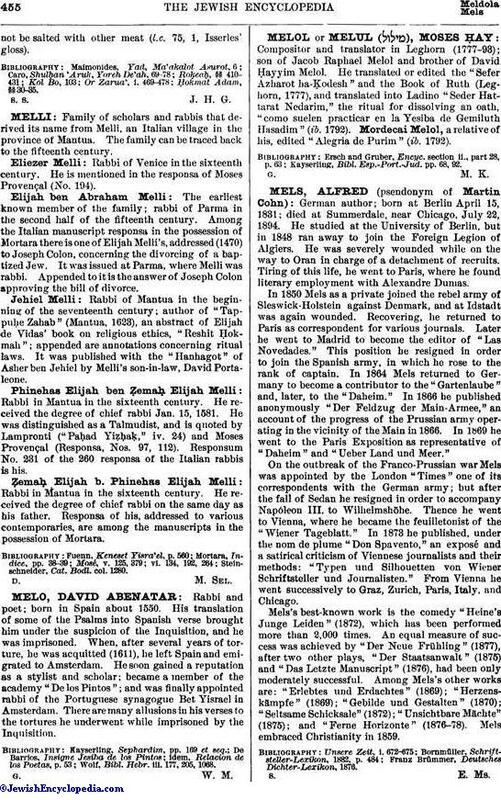 It was issued at Parma, where Melli was rabbi. Appended to it is the answer of Joseph Colon approving the bill of divorce. Rabbi of Mantua in the beginning of the seventeenth century; author of "Tappuḥe Zahab" (Mantua, 1623), an abstract of Elijah de Vidas' book on religious ethics, "Reshit Ḥokmah"; appended are annotations concerning ritual laws. It was published with the "Hanhagot" of Asher ben Jehiel by Melli's son-in-law, David Portaleone. Rabbi in Mantua in the sixteenth century. He received the degree of chief rabbi Jan. 15, 1581. He was distinguished as a Talmudist, and is quoted by Lampronti ("Paḥad Yiẓḥaḳ," iv. 24) and Moses Provençal (Responsa, Nos. 97, 112). Responsum No. 231 of the 260 responsa of the Italian rabbis is his. Rabbi in Mantua in the sixteenth century. He received the degree of chief rabbi on the same day as his father. Responsa of his, addressed to various contemporaries, are among the manuscripts in the possession of Mortara. Steinschneider, Cat. Bodl. col. 1280.